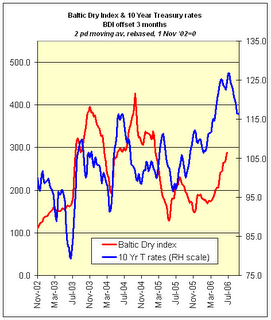 How good is the Baltic Dry Index as a proxy for global economic activity? Still worth looking at - but with a proviso since 2006. 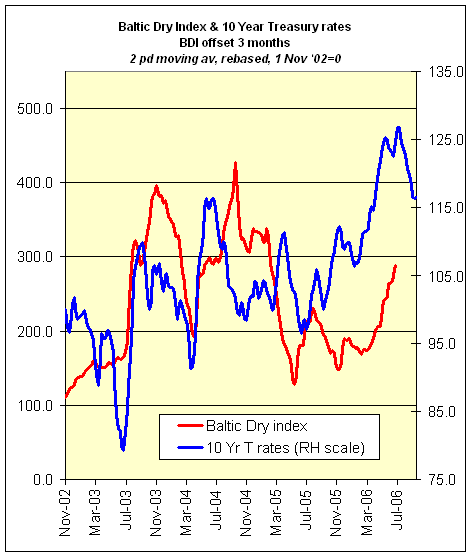 As China moves in 2006 to being a consistent net exporter of steel its influence over an important driver of the Baltic Dry Index (BDI) – iron ore for steel production - grows. But China’s massive growth in steel output has come in large part though government intervention. This, to some degree, is distorting the underlying freight rate picture. To what degree is key. The level and volatility of the BDI is influenced not only by total commodity demand but also by fuel costs, seasonality, fleet numbers, route bottlenecks and sentiment. These additional factors should temper conclusions about the relevance of China’s steel activities on the level of the BDI. The BDI has in the past been helpful to assessing global economic activity. It is, after all, a reflection of real prices paid to ship production inputs across the globe. Since March this year the index has been on a tear, rising 70%, or 1,750 points. Hang on – aren’t we supposedly on the cusp of an economic slowdown? If 10-year treasuries still lead the BDI (as in Exhibit 1) a dip in the BDI is around the corner. Some other indicators also suggest this may be the case - drops in crude prices, widening US credit spreads, inversion of the 10 year vs 3 month US yield curve, a flat S&P500 versus the prior six months and the Chicago Fed’s National Activity Index all signal below trend growth in the US, the main driver of the global economy. Meanwhile, though, the BDI marches up. Some explanation for its rise lies in the summer heatwave in Europe. Several nuclear reactors - in Spain, France and Germany - were shut down or operated at reduced output because the waters cooling their cores were too warm. Increased thermal coke was shipped to fire the power stations plugging the energy gap. However, thermal coke is only 18% of the total dry bulk trade; and these incremental shipments, a fraction within that, cannot account for most of the BDI’s increase. But huge steel production by usual suspect China, demanding impressive quantities of iron ore imports, might. China’s imports of iron ore represented 13% of total dry bulk trade in 2005. Given that in the half year 2006 Chinese iron ore imports jumped 23% that share has at least held steady and probably risen. 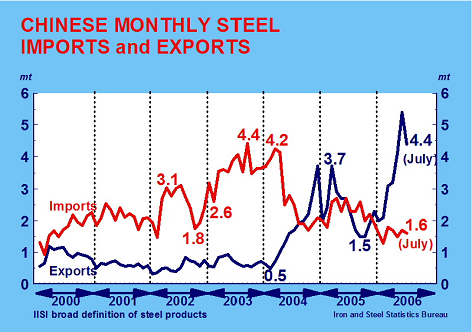 Chinese steel production has correspondingly accelerated. To June 2006 it churned out 35% of global output and has become a consistent net exporter of steel since the start of the year. Which is essentially the same time period over which the BDI has counterintuitively taken flight. 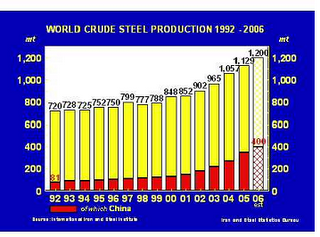 Unfortunately, China’s steel output is not entirely demand led. A recent study by the American Iron and Steel Institute and the Steel Manufacturers Association argued that China’s production has been driven by WTO violating trade protections and subsidies. While both organisations might want to consider the relative shades of kettles and pots much of what is alleged rings true. If so, China is in effect artificially boosting freight rates on an unprecedented scale (by having become the largest iron ore consumer and steel producer). Having saved non-sino steel producers from their own chronic overcapacity through large imports over the period 2000 to mid 2004 China is in danger of joining the bane of the industry. And possibly just in time for a trough in the global economic cycle. Clearly, China is but one factor at work on BDI freight rates alongside fuel costs, ship numbers, seasonality, sentiment, port and route traffic, and global commodity demand / GDP changes. But it is there and is becoming more politically thorny now the country is a net exporter of steel: how does a nation employing over 2 million in steel production* realign its output with demand without social turmoil - and without provoking WTO trading partners? In the meantime BDI readings should probably be interpreted with a bit of care. * A 2001 statistic, the most recent found. Since then China's steel production has tripled. Employment numbers have doubtless balloned too.